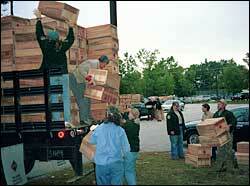 The Fish and Game stocking crew unloads crates of pheasants. Photo by Eric Orff. Successful thirteen-year-old Chris Forsey, with Rick Orford, both from Webster, hunting in Hopkinton. 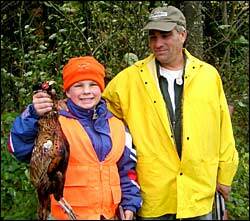 New Hampshire’s pheasant hunting season runs from October 1 through December 31. In 2019, 11,518 adult ring-necked pheasants will be purchased and released across the state. There will be approximately 63 stocking sites in 44 towns this year. Pheasant season will be closed statewide until noon on in-season stocking days. In-season stocking days are October 3-4, October 10-11, and October 17-18. The tradition of pheasant hunting is available only because landowners continue to allow hunters access and areas to hunt pheasants. Please, respect their property. Take the time to thank them for their generosity and help keep the lands open. The following list provides a road name for sites stocked with pheasant. Locations with italicized bold print are state managed lands while the rest of these sites are on privately owned land open to hunting. Locations with more than one stocking site on the property are so noted. 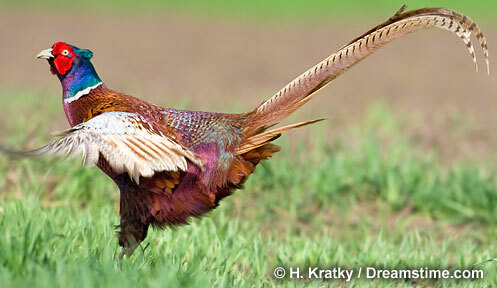 The ring-necked pheasant is one of the most colorful of the game birds. It prefers to run rather than fly and can test the most skilled bird hunting dog with its hide-and-seek behavior. Pheasant hunting has a long history in New Hampshire – the first pheasants were stocked here over a hundred years ago. Today the time-honored tradition of pheasant hunting is possible in the state only because private landowners continue to allow hunters access to their land. The pheasant program relies heavily upon cooperative relationships with landowners. Please remember to respect the land and property owner’s rights to privacy and safety on all lands open to pheasant hunting and stocking. Respect farmland and do not drive on agricultural fields or block gates or bar ways to pastures and croplands with vehicles. Responsible behavior towards other hunters and other outdoor users will keep property open for everyone for years to come. Please take the time to be courteous and thank these landowners for their generosity. (603) 744-5470 to request an information packet. Participating youth must be between 12 and 15 years of age. Events may be held on Saturday and Sunday of the two full weekends in September immediately prior to September 29.